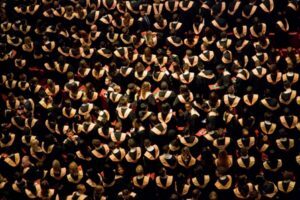 Britain should radically change its course when it comes to higher education policy, according to a new paper by Tim Blackman, Vice-Chancellor and Professor of Sociology and Social Policy at Middlesex University. In The Comprehensive University: An Alternative to Social Stratification by Academic Selection, which has recently been published by the Higher Education Policy Institute, he argues that the UK should radically reform its universities by dismantling the system of elite institutions that currently exists in favour of “comprehensive” universities that wouldn’t select on the basis of academic ability. Could this idea work in practice? The principle behind the idea of comprehensive universities is relatively straightforward. At present, virtually all universities employ academic selection, with the most elite institutions in the Russell Group requiring the highest A-level grades from prospective candidates to gain admission. Famously, Oxford and Cambridge employ the most exacting standards, with most candidates having to survive a tough one-on-one interview to be offered a place. It is well known that, unfortunately, better-off young people are significantly more likely to attend a Russell Group university. Although roughly the same proportions of young people from both state and private schools go on to universities (54% vs 60%), data from the Department for Education show that the ones who went to private schools are five times as likely to win a place at Oxbridge, and twice as likely to get one at any Russell Group university, compared to their state-educated counterparts. Given that access to so many well-paid white-collar occupations now relies upon getting a degree from a “good” university (often shorthand for Oxbridge or the Russell Group), the fact that their intakes are so socially skewed acts as a severe drag on social mobility. The report makes the well-observed argument that there is a contradiction between the discredited status of selection based on academic ability in secondary schools – which the recent furore over Conservative plans to expand grammar schools neatly illustrated – and the way that it is still embraced in our higher education system. If we have largely accepted the argument that academic sorting at school level is unfair because it merely creates a veiled form of selecting by social background, and there is overwhelming evidence to show that our universities are extremely socially selective for the same reason, then why do we continue to find academic selection in universities acceptable? The paper argues that rather than having a higher education system which is constructed on a premise of elitism and inequality – where the students with the best prior qualifications are concentrated in the relatively small number of top institutions – it would be better for both students and the national economy if we encouraged excellence across the board. The paper says that this could be achieved in a number of different ways, through such mechanisms as setting quotas – for every university to meet – on the proportion of places that can be subject to academic selection, and creating a system of fines for universities that have an intake that is too socially skewed. Of course the difficulties with this proposal are obvious. Many would argue that penalising the best universities is no way to make up for the shortcomings of Britain’s secondary schools; that penalising young adults, who have worked hard to get good qualifications, just because they come from better-off backgrounds would be grossly unfair; and that there needs to be some academic selection in universities to ensure that the people who they train for specialised careers (such as medicine or architecture) are capable of working in those professions. While such counterarguments can be raised against this proposal, it is at least refreshing to see so many new ideas about higher education emerging in the febrile post-election environment.